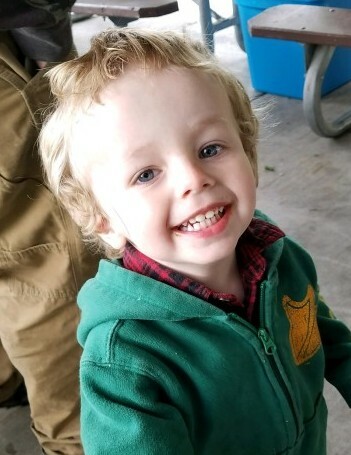 Gaberiel “Gabe” Steven Saddler, 2, passed away on March 18, 2018, in Prineville, Ore. There will be a celebration of life on April 7, 2018, at the Calvary Baptist Church on Main St. in Prineville, Ore. at 11:00 a.m. with a Potluck to follow immediately after the service. Gabe was born on April 1, 2015 in Redmond, Ore. to Kayla Knieriem and Joshua Saddler. He was a very sweet boy who enjoyed playing with toys, smiling, singing, laughing and eating food with ketchup. He loved to go fishing and camping with his dad. Gabe was loved dearly by his Mother Kayla Knieriem, brother, Avidyn Coffman, and grandparents, aunts, uncles, and cousins. Gaberiel is preceded in death by his father, Joshua Saddler, grandmother, and step mother, Mary Beth Saddler.